Today’s article features an interview with Pat Katepoo, author of the ebook, How To Get Six Weeks Off To Travel. What are some of the ways you’ve seen people spend their six weeks of travel? The ways are as varied as the individuals: some have taken time to learn a new language or a new way of cooking through cultural immersion; others have challenged themselves physically with adventure travel, such as a multi-day hiking or rock climbing expedition; many people are interested in giving back through a volunteer vacation or missions trip. But the underlying reason? They need a break from work! People who’ve had their nose to the grindstone for years eventually hit a point where they feel drained of creative energy and thought. They might feel stuck professionally or very weary. It may not be full-blown burnout, but there’s a genuine need to step aside from the usual work routine. A sabbatical can refresh their thinking, renew their energy, restore their creativity, and recharge them to new levels of productivity. Your book proposes six weeks as an ideal length of time for a sabbatical most likely to be approved by employers. What are some of the reasons you chose six weeks as the focus for your proposal outline? While I’m certainly in favor of sabbaticals that are six months or more, there is less management resistance to a request for six weeks off. For one, a six-week sabbatical can be presented as typical because it closely parallels the five-week average among employers who have sabbatical leave policies. Further, six weeks off is, unfortunately, the American standard for women going on maternity leave, so many managers and coworkers are familiar with planned absences of that duration. So from a negotiation standpoint, a proposed plan for work coverage during a short-term sabbatical leave can be positioned as similar to a maternity leave. Are sabbaticals offered by most employers or are they relatively rare? Outside of the academic world, they are still relatively rare. That’s why, for most professionals, if they want one, they have to craft their own plan and proposal to present to their employer. What are some predictors of success in getting a sabbatical approved? How does your ebook help employees in their effort to win approval for a sabbatical? 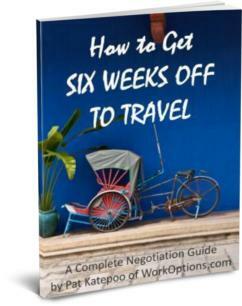 How To Get Six Weeks Off To Travel is both a workbook and negotiation guide. It walks the user step-by-step through the planning and request process. The core of the Package is the practically-completed proposal template with its persuasive wording for winning approval. Beyond that, there are several ideas for addressing work coverage, multiple ways to present the employer benefits of your sabbatical to your manager, a month-by-month preparation checklist to follow to reach approval, scripted replies to objections, conditions for getting a paid sabbatical, and even a motivation chapter to keep on track toward the goal. With a solid plan, it’s very doable to make a short-term sabbatical dream come true. How To Get Six Weeks Off To Travel provides that plan.